This recipe for slow cooker chicken and gravy was so easy! All I had to do when I got home was whip up some mashed potatoes and heat up some corn. My family loved it, and my 3-year old asked, “Can I eat this everyday? For breakfast, lunch and dinner?”. It was too funny, she’s either crazy about a meal or she will push it to the middle of the table, and refuse to eat it. She is so dramatic at times. To make the chicken and gravy, you start with 2 packets of chicken gravy mix,1 and 3/4 cups of water, a can of cream of chicken soup, and a 1/8 of a teaspoon of black pepper, whisk until the gravy is as smooth as you can get it. Then put the chicken breasts in. Slow cook for 8 to 10 hours on low. I served this chicken and gravy on mashed potatoes over a piece of sourdough bread. This recipe is my cookbook which is available on Amazon and Barnes & Noble, the book has many more that aren’t on the site! Put the gravy packets, cream of chicken soup, water and pepper in a 4 quart or larger slow cooker. Whisk until the gravy is as smooth as you can get it. This sounds wonderful!!!! My husband loves gravy so this should make him very happy and that makes me happy! Thanks for a great recipe! I’m going to try this! It sounds very yummy! I might try using chicken stock in place of the water though. Going to do the same thing Danielle…do it all the time when using those packet gravies…just be sure to use low sodium or it will be very salty. I think I’m also going to use Cream of Mushroom soup instead. Great recipe…who’d of thought chicken and gravy could be so easy. So you made it or simply complaining for the sake of complaining? This sounds like something my family would really go for. My question, the chicken in the photo looks to be shredded, but there is nothing stating to do that in the recipe? Haven’t you all noticed; any meat cooked in a crock-pot ends up shredding. Right: it doesn’t change the flavor and makes it easier to use as leftover in salads &soups. Mmmmmmmmm … love my slo-cooker! I am sure you can shread it after its cooked if you want do or just cut it up and eat it. However you want to do it, it wont change the flavor. Are the chicken breasts frozen or thawed? Can’t wait to try it! I used frozen breasts with no issue both times that I made it! Chicken usually takes 4 hours on low, 8 hours if frozen. I use frozen all the time! I took a slow cooker class and they taught us you could do this. I think it’s sometimes more juicy. I even do it with beef or pork roasts – just add an additional 4 hours (so I cook roast about 12 hours). You run the slight risk of food poisoning if you use frozen. I use frozen sometimes and have never had a problem. The low setting in conjunction with the frozen meat provides a good breeding ground for bacteria. As long as you stir it and make sure all parts are at around 165° or higher you should be fine. I would never use frozen if I was making it for a potluck or something where people with a weak immune system could eat it. Even a low risk is not worth it when the consequence could be severe. Great to know!! Thank you!! Can i make this on high in the crock pot. How long do you think it will take. Was thinking of making this tomorrow for dinner. Sounds and looks delicious…. I would say 3 1/2 to 4 hours for the high setting. It is so yummy! I made this for company the other night and they all wanted the recipe. I used sodium free chicken broth and threw in some fresh mushrooms. I am 76 and since learning about crock pots about one year ago, I live with mine. This is an excellent site. You are doing great, Sarah. this comment is so sweet. I made this tonight and we loved it. It was so easy! I had half an onion I needed to use, so I sliced it and added it to the pot. Cooked on high for 4 hours. This really sounds good.The only thing ius i can’t print the recipe because it comes out so light you can’t see it :O( lol so i take & cope it & paste it & send it to myself.Thank you for a good sounding recipe & i wi,ll be trying it. You will love this recipe Margie! There’s print button, in the box where the recipe is, this will make the recipe print black for printing. 🙂 Thanks for stopping by. 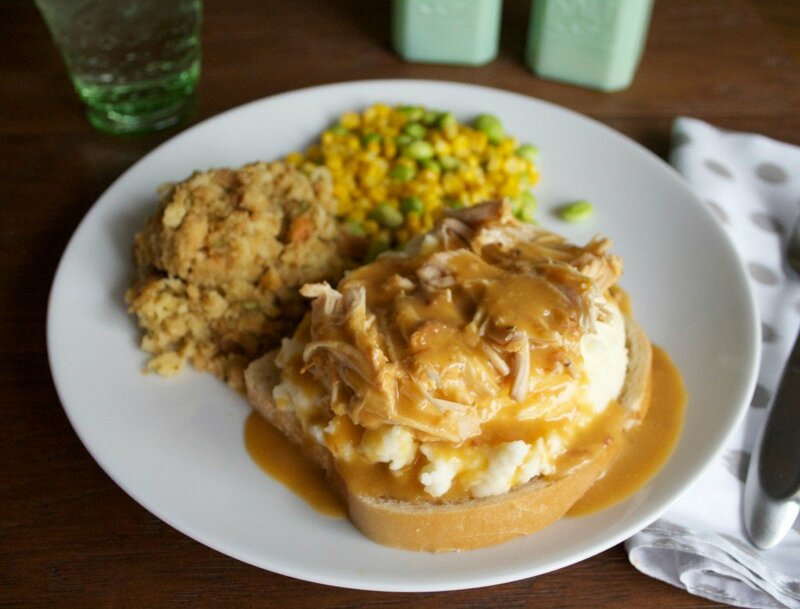 To make this yummy recipe easier yet, try the already made ‘Bob Evans Mashed Potatoes’ to go with it. They are the best and so quick! I’ve stopped making regular mashed potatoes since my neighbor told me about these. Great recipe! I use the Ore-ida mashed potatoes in the refridgerated section…they aren’t as salty, and come in flavors just as bob evans do. I haven’t made real mashed potatoes for years now and I am pleased with these. This recipe will be the next one I try..love it! Sounds really good,if one has feash@or dried herbs I would add thyme,rosemary,chives or whatever fresh herb you like,plus garlic.@onion. would the breast be bone in or out? Skinned or skinless? I am trying this tonight!! I added a bit of poultry seasoning to give it more flavor. It smells wonderful already! I am making this again tonight and had to look up the recipe.. I realized I never commented on how it was last time! My kids loved it!!! They even requested the leftovers for lunch the next day!!! They are picky eaters, so it’s hard to find something that everyone likes! Wondering what difference might be if made with boneless, skinless thighs instead of breasts? Thank you. I think boneless skinless thighs would be wonderful. It would be dark meat chicken and gravy, and have a richer flavor. Thank you so much. Looking forward to making this in tonight or tomorrow. Will let you know. Thank you so much for the recipe. Hi Sara would you recommend this same recipe for bone in legs? I don’t see why not, I would probably brown the legs first in a skillet. Let me know how it turns out! The legs were AWESOME Sara!!! So awesome that I had to fix it a second time for my family! Thank you so much!! Fantastic! I’ll have to try legs now! I used boneless, skinless, thighs and it was wonderful. I also used Cream of Mushroom soup instead. Didn’t have the cream of chicken soup. Also used a little Kitchen Bouquet to darken the gravy. My husband doesn’t like white sauces so I always add Kitchen Bouquet! Now I know where my wife got the recipe from. She woke up not feeling well and left the recipe on the counter and hinted this would be nice for dinner. I took a look, went to the store and viola- even I can do it. That’s so great Harry, what a great husband. You will love this recipe! I applaud you Harry! If only I could get my hubby to try! Your wife is lucky to have you. Could you do this in the oven? I know, I know – this is for crockpot cooking, however my husband can’t seem to figure out how to like things that are not cooked in the oven – silly man. This sounds so wonderful for our cold MN nights!! Thank you!! Thank you for the info! I’ll update when we try it! I would love to try this tomorrow. I would like to add red potatoes and onion to the pot. Would you recommend that me to add any more gravy ingredients??? It should be fine with the amount if gravy in the recipe, unless you are doing a ton of potatoes and onion, you could just Add 1 more gravy packet and probably 3/4 cup more water. I am making this on Friday. Do you serve it over rice or potatoes? I can’t wait to try it, it looks so good. I usually serve this over mashed potatoes, but rice would be really good! If I were to make half the recipe (I only cook for myself) how long would you recommend cooking it for? 7 hours on low, would work great! I am a working mom with a very busy 2year old. So I’m always looking for delicious easy crockpot recipes. Loving your website!!!!! Thank you. Pretty excited to make this this week. Do I need to double everything if I use 3 large chicken breasts…about 2 pounds total? I have never doubled the other stuff and always use about 2lbs of chicken breasts… And there has always been tons of gravy… I also start with frozen breasts. Thank you Sarah and Alisha!! I’m so looking forward to throwing it all in the slow cooker tomorrow and kicking my feet back when I come home!! I left it in the slow cooker on low at about 6:30am and won’t be home until 6:00pm. You think it will be ok and not dry out? Lol Thank you. The Chicken should be fine, how did it turn out? This sounds good. I think I will try it over waffles. This chicken was delicious and easy! My whole family loved it, even my 2 year old who has been very picky at dinner time recently. I will be making this regularly. Thanks for sharing this recipe! Hi, can any leftovers be frozen? I haven’t tried yet, has anyone else tried freezing this with success? This looks so yummy. I’m making it right now. I think I’ll post it on my blog if you don’t mind? I will of course link back to you as the originator. This looks amazing!! Can’t wait for it to be the first thing I make in my crock pot this year! I’m wondering…I’m using an already made gravy recipe (since I can’t have gluten that’s in most mixes)…Do you know how much I would use of that? Or will it be better to try to find a gluten free mix? Sarah, this was amazing!!! And SO easy! My boyfriend actually told me last night that it was probably one of the best meals he’s had. And I had to agree!! 🙂 Thanks for all your help and your wonderful recipes!! Could I use a whole chicken? If so would all the ingredients stay the same? It would be worth a try with a whole chicken! I’ve haven’t tried yet. Let me know how it works out! I’m also really curious about the whole chicken? Did you try it Ashley? 🙂 some dark meat sounds great!! Hey Sarah, another quick question 🙂 I’m making this again this afternoon, and I’m adding more chicken, about another lb or so (wanted some dark meat in there too) I’m wondering, does the chicken add liquid as it cooks along with the water? and should I add less water if i’m doing more chicken? I LOVE the gravy! Just don’t want it to be too runny. Thanks again! It does add a little liquid, but it should be fine, you can always leave the lid off for a while if it is too runny. 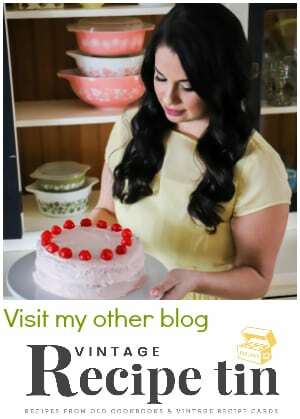 This is my first time visiting your blog…and I love your posts!! I have a 3 yr old crockpot that has never really cooked things well, which has closed my mind to so many amazing options. I love to make cassaroles and VAST amounts of soup, walking away and having dinner done is what I really want as a lifestyle for us now that we are retiring. Is there a “best brand” or size I should look for? My favorite crock pot is a 6 quart Crock-Pot brand, with a timer that turns to warm after the cooking time is done! I use it for everything! It always cooks perfectly. I made this tonight and it was really good. I’m curious my gravy looks more yellow while the picture looks more like brown gravy……why is that? I did use chicken gravy packets, I wonder if the brands were different, I think I used Mccormick brand. I’m glad it turned out good! Going to try this today. I have the large container of McCormick Poultry Gravey Mix. Should I use the mix dry amount listed for 1 1/4 cup gravey , then follow your directions for liquids? I think so! You may need to thicken the gravy up at the end since the Turkey will have more liquid than 2 pounds of chicken. Thank you so much for your timely reply. I’ll use some flour. I’ll let you know how it comes out. Recipe states 2 cups water. Used Cream of mushroom and brown gravy. Skipped the mashed potatoes and just used dinner rolls, so delish! I am going to try this recipe for a potluck and need to try and figure out what the ingredients would need to be to serve around 20 people. If I was doing this for 20 I would do 4 pounds pounds of chicken. And times the gravy recipe by 3. And Cook on low for 8 hours. Let me know if you have more questions! Made this the other night, made the gravy from chicken stock and added mushrooms. Did not use potatoes or bread, put it over rice. The plates came back clean. Oh rice would be so good! Glad your family liked it Ron! Could you use bone in with skin? Hi Charlene, The problem with bone in for 8 hours, it would be very moist, but chicken would be so tender that the bones turn into little splinters, and the skin would be soggy. I’m sure theres a way to do it cooking it for less time, and maybe throwing the chicken under the broiler for a few to crisp it up. I have a 4lb pack of drumsticks that I’d like to use in this recipe, for my oldest son that is coming home today from his first year of college!!!! Should I brown/broil them before putting them in the slow cooker? If so, about how long on each side? Also, how much gravy should I use?….The drumsticks will be at least two layers high. Thank you!! I would double the gravy, and cook on high for 3 1/2 to 4 hours or low for 5, then take the chicken out and broil for 5 minutes or so on each side, watch them carefully so they don’t burn. this recipe was a hit in my home! there are 8 of us all together so i had to multiply the recipe a couple times to feed everyone. they wouldnt stop talking about how delicious it was. i always make extra for left overs and the next day they were gone. i served it with egg noodles or mash cause i have picky people in my house LOL it went well with both choices. Whats the 2 cups of water for that ppl are talking about the recipie says 1,3/4 ??? Let me know how it cooks in the oven 🙂 I hope your grandson like it! I made this & it IS easy and delicious. I found it a bit too salty. Perhaps using the 2 cups water would help OR use canned chicken gravy instead of packets IF it has less salt. I’ll definitely make it again! I have 2 crock pots and I am afraid to leave them all day long. I am working all day. I know this sounds silly, but I’m afraid of things burning and drying out. I would love to start collecting recipes. Can you suggest some? I know this is a silly question but when you use the can of soup do you make the soup or just use empty the can of soup in the crock pot. Thank You. Not knowing has stopped from making a number of dishes . This recipe looks simple and great Sarah! I made a receipe like this and it had stuffing on top and baked for 8 hrs. On low. Used my homemade stuffing and boxed, make as on pkg. it was terriffic. Made this yesterday with bone-in chicken thighs, 1/2 of a large zucchini cut into 4 pieces and 1 whole onion, quartered. 2 cups water and low sodium chicken soup; just the best and easiest meal to date in my slow cooker (which BTW I bought for $5 from CL!!). I would have added fresh shrooms is I’d had them. sigh. Next time!! I made this and added a pkg of sliced shrooms and 1 pound of baby carrots…1st hour on high to make sure the chicken is hot enough (frozen chicken) and 6 hours on low…Simply Fab!!! The mushrooms and carrots sound awesome, thanks for the tip Kathi! We made this tonight, and it was pretty good. We used 3 pounds of chicken, and doubled the gravy. Seemed like a ton of gravy, but after sitting for five minutes or so, a lot soaked into the chicken. We probably could have done about 1.5 times the gravy ingredients, and it could have used a little salt for our tastes, but it was good enough that we didn’t walk 8 feet across the kitchen to get it. So this will definitely be added to our recipe list a couple times a month. Can you use the jar chicken gravy instead of packs and can you use chicken stock instead of water? You could, but the gravy packets have a better flavor than the jarred gravy. This came out amazing! I am a (recently turned) single mom to a 17 & 2 year old, plus work FT as a social worker. You can imagine how hard it is to get everyone to eat the same thing at dinner…. I refuse to get fast food and enjoy cooking but don’t have the time I used to. I saw this link on a friend’s facebook page and let me tell you, everyone LOVED it! I did mashed potatoes and corn with rolls as sides and it was so, so yummy. 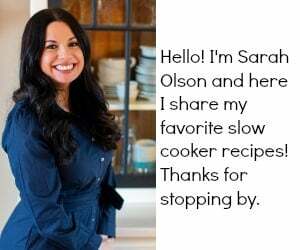 I can’t wait to try more recipes on your site! Thank you! I found your recipe on Pinterest one day and decided to make it without looking in my pantry to make sure I had everything I needed. Unfortunately, I did not have a pack of chicken gravy mix so I decided to add an envelope of onion soup mix instead. It was amazing. I’ve made it several times since then and have used onion soup mix every time. Thank you for such a great, versatile recipe. I think that would work ok. It may be a little on the salty side though. I love this recipe! I have made it many times and lately I’ve been adding mushrooms. Our 1 year old is really in to finger foods, it has made a nice addition! Thank you for this recipe, it’s great on a cold winter day! I made this tonight and it was the best chicken I ever made. I didn’t shred it like on the picture ,but I will next time now that I know how tender it is. give this a try ..I think you will enjoy the tenderness of the chicken. so yummy!! I make this all the time with frozen chicken and just before serving I shred the chicken and add a half cup of sour cream with whisk. This helps thicken it a little more. Absolutely the best dish ever! I just put mine all in the slow cooker now, I added some mushrooms to it and I used chicken broth instead of water. Really looking forward to it. I am putting it on high for 4 hours, hope it turns out ok. Sounds great! Let me know how 4 hours on high does. Sarah, it was great putting it on for 4 hours on high. What a delicious dinner. I am going to make it for my grandsons, I am sure they will love it. Hi Sarah, I have a quick question. How much is in a serving? I’m trying to figure out the calories. Thanks!! The entire recipe serves 4. So when serving divide the meat and gravy in 4. Sorry I don’t have measurements. Oh Ok Thanks!! In your opinion, Do you think its about 1/2 c or do you think about 1 c.
Sounds and looks yummy, trying this tonight! My husband and I are following a low-carb diet so I replaced the bread and mashed potatoes with mashed Cauliflower and spaghetti squash. This recipe is so easy to diversify to your liking. Thank you for the idea! I really need to try cauliflower rice Shay. I am trying to cut back my carbs, and dinner is the hardest meal! is it possible to make this for 16 people? maybe use 2 crockpots and double the recipe in each? i need something like this for our family reunion. My husband absolutely LOVED this! He has no idea how I “slaved” over it – ha! Soooooo easy (I put the breasts in frozen, even). He asked me to make it again the very next day…this meal will be made often in our house – thank you! This would be good over biscuits too like chicken a la king. Awesome idea Sue! So many options for this dish! I am trying this with a pork tenderloin instead of chicken.. using pork gravy packs and cream of mushroom soup… Will let you know how it comes out.. I seared the pork roast first.. ( Hubby’s Idea).. Smells great already.. I never rally cooked in a crock pot till we moved into our RV.. Pretty cool little gadget…. Hi Patty! I have a similar recipe on my to do list! I was thinking about adding garlic and herbs. We are on our way camping now in our travel trailer, I have 3 meals planned out, it’s the best way to cook in a small space! I doubled the recipe using half breast and the other half thighs..I cut the breasts up so they could all cook evenly…I plan on shredding it..should I cut down the cook time since the pieces are smaller? You could cut down the time to six hours, but the chicken will stay moist even if it goes for 8 hours with all that gravy. I checked it about 5hours and it was done…then turned it up to high and left the lid off while I made the potatoes. It smelled great and I was starving..I couldn’t wait any longer 3 more hours! It was delicious and my family loved it! We will definitely be having this again, thank you! I made this once already and it was delicious. I purposely tried to keep my chicken together and served it just like chicken dinner with cranberries and all the fixings’!!! !…….making it today as well. I always tweak recipes to suit me, so I did brown my chicken first in a little olive oil on the stove top, used chicken stock and poultry seasoning (summer savoury)in the recipe just to add to the flavour (but just following the recipe would be good too!). THIS IS SOOOOOOOOOOOOOO GOOD! Served it over mashed potatoes! Delicious! Thank you so much for the great recipes. I’m going to be buying your book after I post this, Sarah. And tomorrow I am making the Homestyle Pork Chops! The only question I have about those is that cooking time. We like our pork tender – 2 1/2 hours doesn’t seem like enough time to get them tender enough. I was thinking more like 6 – 8 hours on low. THANKS! Hi Patti! I’m glad you liked the chicken and gravy! And for the pork chops, that one is my friend’s recipe. I would think cooking that one longer would be fine. You know what I did that was AMAZING was I used this recipe, but used pork gravy packets, added some herbs and a garlic clove, and used a pork roast, 8 hours on LOW. Turned out perfect. Nice to meet you! Hi Sarah, I loved this so much. I made it just like it said. AWESOME!!! This time I don’t have 8 hours to make it. I have it in the crockpot now, and cooked it on high for 4 hours, the 4 hours was up at 3:00, but I’m not eating it until about 5:30 or 6:00. I put it on low at 3, will it be dried out or too done by 6? Thanks. I think you could do low for another hour, then switch to warm for the last 2 hours or so. It should be fine no matter what, this recipe stays moist very well with all that gravy. I am so 3excited to try this dish! I feel like one could do a lot with it 🙂 Do you think i could premake and freeze? I think it would do well as a freezer meal! 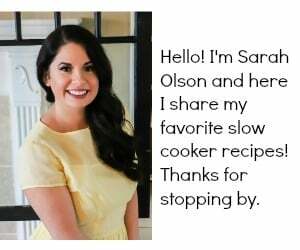 O Sarah I can’t wait to try this yummy dish ~~ what size crockpot did you use….I always chuckle at the crockpot recipes …. no one ever says what size for their recipe….and darn I’m not an expert….but if a recipe is for a 4 qt. crockpot and cooked in a 7 qt. would that change things or dry them out terribly??? Thank you ~ I’ve pinned this recipe and would love to join your blog but my email address hasn’t been working for several months ~~ I know that should be easy but I’m 65 and handicapped ~~ so out of the loop ~~ I can taste this recipe of yours and can’t wait to try ~~ my crockpot is 7 qts. don’t mind doubling and freezing….but on a fixed income….just give me a heads up ~~ fabulous comments you have gotten!!! don’t forget I don’t have access to my email address ~ I’m on facebook ! This recipe would work fine in a 7 quart without doubling, I added the slow cooker sizes to the recipe, sometimes I forget to do that. What if you don’t have a cream of chicken or mushroom soup and no time to run to the store…. Do you have any other soups? If not it may be fine without it! I’ve actually seen recipes with just the gravy and water. I love this recipe! I did make a few substitutions because with two young children running to the store is a hassle. I didn’t have any cream of chicken or mushroom but I did have cream of celery. And I had to sub one packet of brown gravy for lack of chicken and it turned out amazing! I make this recipe at least once a month. Thank you!! Has anybody had success cooking this on high? If so for how long? Did it dry it out? I want to make this tomorrow for dinner! I don’t have gravy packets but have onion/mushroom soup mix packets. Think it would be an okay substitute? Hi, I’ve used about 3 Tbsp of flour mixed with dry chicken broth, garlic powder and minced onion. Or canned chicken stock. Just whisk in good. I experiment with this dish. It is the best ever and our family favorite!! Hey, could you make this with boneless pork chops and pork gravy – plus a can of cream of mushroom soup? Looking to make this with boneless pork chops and pork gravy packets. Would cream of mushroom work for the soup – or would some other cream soup be a better fit? Golden mushroom soup is very good on pork. I will try that. Wondering why I haven’t bought it before! I made this today and we loved it. The only thing I did differently was that I coated my chicken in flour first. I just wanted to be sure the gravy would be thick enough for my liking. It was so good! I was really surprised that such a simple gravy would be so packed with flavor. This is a keeper for sure! I have had this on my wish list to cook and will be cooking tonight. I realized when looking at the recipe again that you use poltry gravy mix but I bought brown gravy mix. Can I stil you that and it still tire out good?? I love any type of gravy on my food, so for me I think it would be fine! I made this today for dinner, but used Cream of chicken with herbs. I also used a large packet of roasted chicken gravy mix from Southeastern mills. It was so good with buttermilk biscuits. I made this just as written and it is now in my recipe box. One of my favorites!!!! Can I use canned chicken gravy instead of the packets? You could, but don’t add much water at all. I used to only use canned gravy for my dinners, but I found that the packets have a much better flavor. Great! I added what the recipe said for water…. I guess we’ll be having chicken gravy soup for dinner!!!!! I just made this tonight and it was a hit. So easy and flavorful. The only addition I made was adding onions that I sautéed until brown. Then I added them right to the crockpot with the other ingredients. My children and husband loved it and had multiple servings. Here is even enough left for lunch tomorrow. A must have recipe. Thanks for sharing. Thanks for coming back to tell me how it was for you! This recipe is a keeper! 🙂 I will try the onions next time, great addition! Can you make this is an electric pressure cooker? This plus instant mashed potatoes makes for a STUPID easy meal (and a couple of portions of leftovers). Has anyone tried this with a white or brown gravy mix instead of chicken gravy? I think I’m going to try brown next…. I made this, but added mushrooms amd used mushroom soup. Everything low sodium. Instead of making mashed potatoes I made cornbread waffles. Huge hit! Trying this recipe tomorrow. I am using country gravy mix, though, because that’s all the store had. Hoping it still turns out ok? It should be fine Rachel! If you think it tastes as little plain, add some seasonings such as oregano or thyme at the end. I like to play with the recipe and add different soups or different gravies. I always add my spices like garlic, onion and I also add dry chicken broth. I have tried using chicken stock instead of water but it was a bit salty. Great recipe! I do not buy the gravy packets. I get a large jar of chicken gravy at Sam’s Club. How many Tablespoons should I use? If it is a dry mix, follow the directions for 2 cups of water, but use a little less water. Hi Mary, Where I live we don’t have jars of gravy. I think that would be better. Does it have less salt. You can buy the packets with less salt now but I still think it’s too much. But very very yummy!! How many tablespoons of what? It is a dry mix and it is not salty. I use it when I make baked chicken,etc. Ok I think I get it now. You buy a jar of dry mix. I would use 2 Tablespoons and just an extra bit for luck lol. Am I with you now? Lol. I wish these recipes stated the volume produced in pints or quarts. I usually try to resize them to fit in my 8 quart cooker so I can cook once and eat many. The actual quantity would help. What type of mashed potatoes did you cook? Instant or homemade? I made homemade. I like this over rice even better cause it’s so much easier. Yum! I modified a bit because I didn’t have all the ingredients. I did a whole chicken, two packs of gravy,2 3/4 cups of chicken broth, plus another 10 ounces of broth with corn starch in it. I didn’t have cream of chicken soup. After four hours, I pulled the chicken pieces out of the slow cooker and stuck them in the oven under broil for about 15 minutes to brown it up. I stuck it back in the slow cooker after it was browned. So tasty! Gravy was a little watery but I prefer it that way. For a thicker gravy you could use less water! I thought this would probably be pretty high in sodium and I’m trying to keep an eye on that, so I only added one packet of gravy mix, decreased the water by about 4 ounces, and stirred in a tablespoon of flour to make up for the missing gravy mix. I also used low sodium cream of chicken soup. It turned out perfectly–just the right amount of saltiness, and the gravy was a great consistency. I also added some fresh chopped parsley on top to add a little color, flavor, and texture. This is awesome. I even just made the gravy and used leftover rotisserie chicken. Just delish. Tried this recipe and I loved it:) Thank you for sharing!!! Just made this tonight. It was really good and perfect with mashed potatoes and roasted garlicky greenbeans. However, next time I will definitely use low sodium cream of chicken and/or low sodium gravy packets. I love salt and it was a little too salty even for my taste and I used water per the instructions. I read others’ suggestions of subbing water for broth and I’m so glad I didn’t as that would’ve taken the salt over the top. I would definitely make it again. Lizzie H, I was going to ask the same thing since I have canned chicken gravy. I make this for my family all of the time and we love it. I would like to make the same with leftover turkey. any ideas? I know I would use dry turkey gravy mix instead but would I still use cream of chicken soup or something different? I love chicken.On diet any way eather me or my boyfriend will make this one. I was wondering if I used thawed chicken breasts instead of frozen what would be a cooking time range on high. 4 hours on high should be fine! Mine had a great flavor but the gravy was super runny. I did it just likd the recipe said, also. Wondering if anyone has ever added potatoes while it’s cooking? Not sure how long to cook them for. I’ll probably use red potatoes in chunks. This was really good! And so easy too. Will certainly be making this again. When mixing the gravy, I used 1 cup no salt chicken stock and 3/4 cup water. What a great comfort food. Hi Keira, I have never tried myself, sorry! Chicken was so moist and juicy that my son asked for it all the time, so I taught how to make it. I froze it and it tasted great reheat in the microwave. I used 2 cups of water to have extra gravy for the mashed potatoes. Has anyone tried with Turkey breast? I would just use turkey gravy instead of chicken. Leave the rest the same. Bound to be good. 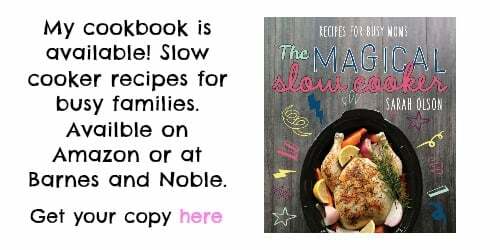 I made your slow cooker chicken and gravy and the family loved it. We had some left so I ate the rest for lunch and of course it was even better. I will absolutely make it again. I may even double the recipe and add carrots. Family loves carrots. Thanks for sharing the recipe. I’m so happy to hear the Tracey! Carrots are the great idea. Cook with sliced carrots. When it’s finished add frozen peas and pour into a pie crust. Top with another crust and VOILA! Chicken pot pie. That sounds really good Barbara! I’ve made this a couple times and it’s always a favorite and easy to put together and not worry about it! I had onions and garlic to mine! !